Training transfer is vital for the employee’s development and growth since it augments or improves employee’s current skills, knowledge and performance. Hence, the objective of this research is to evaluate, assess and review the impact of the work environment, individual characteristic and training design towards training transfer. These factors have a substantial effect on how trainee would be able to transfer all their learnings, skills and knowledge from a learning activity into the workplace. Knowing the impact of these different factors could determine on how to effectively transfer all learnings from a training activity and the possible obstacles that a learner may encounter in applying these newly acquired skills, knowledge and competence. These factors will be studied and analyzed throughout the research. The research will conduct comprehensive analysis through data gathering platforms such as survey and questionnaires. A subject group with different demographic background or sector will be commissioned to answer all questions truthfully. Their answers will be analyzed and interpreted by different quantitative parameters and standards to determine the impact of these factors in training transfer particularly in Saudi Arabia. All related sub-factors (supervisor support, peer support, self-efficacy, goal orientation, training design and training content) will be evaluated to closely check the relations of the success and failure of training transfer. Companies or organizations in Saudi Arabia has very diverse workforce since they are employing several nationalities/expatriates in their organizations. Therefore, the research can valuable to check the relations of the above factors in training transfer especially on a diverse work landscape like in Saudi Arabia. Having a diverse workforce could provide good bases for analysis since it can cover different work environments and larger perspective of individual characteristics. It can provide a view about the training designs and content in several companies in Saudi Arabia. Three different major factors and six minor factors will be discussed and analyzed in this research. The results and finding could be diverse and border since it covers the diverse workforce in Saudi Arabia. The results will be based on personal experience, feedback and views of the focused group in the research through the research methodology we utilize in conducting this studies and interpreting its results as well. Training is an integral part/aspect in Human Resource since investment in human capital can increase productivity and efficiency within the organization. Training increase job satisfaction, retention rate and motivation of the employees towards their organization. That’s why companies or organizations are investing and allotting budget for manpower development. However, the effectiveness of training lies on how employee/trainee apply newly acquired skills, knowledge, and competency in their respective workplace. Hence, to ensure that these training benefits can be mutually utilized by employees and the organization/company, training transfer should be observed and applied as well. The effectiveness of training transfer may depend on several factors such as work environment, individual characteristics, and training design as well. Such factors have an impact if training transfer can be fully achieved. If the work environment is conducive and supports trainees/employees then training transfer to occur. Work environment includes how the supervisor supports his/her employees or subordinates. And, how his/her co-worker supports them in applying their newly acquired skills, knowledge and competencies in the workplace. Work environment condition or current state could impact learning transfer and how it can be realized within the organization and experience by employees/trainees. Individual characteristics play important role in ensuring the effectiveness of training transfer as well. An individual characteristic such as self-efficacy and goal orientation could impact the application of the training benefits into the workplace. Self-efficacy can be defined as the individual beliefs and confidence that he/she can achieve success and accomplish tasks. It the individual confidence and conviction that he/she can apply all learnings from a learning activity or training into the workplace to meet or surpass expectations, target, and deadlines. While goal orientation involves individual‘s positive outlook and character to develop her/himself to achieve greater results, surmounted success and accomplishment. Training design is vital consideration and factors in training transfer. Training design should be based on the individual’s training needs and requirements. A formulated training design that addresses employee’s skills and knowledge inadequacy. It could be tailored or modified training design that can help the individual to improve or acquire necessary competency in a specific area. Identifying or determining several factors that impact training transfer is beneficial to ensure that training benefits could be completely realized and experienced. These factors can be obstacles or source of reference for the failure or success of training transfer within the organization. The purpose of this research is to identify the impact of working environment, individual characteristics and training design in training transfer or application of all learned skills, knowledge, and competency in the workplace. As well as, closely checking and analyzing sub or minor factors such as supervisor support, peer support, self-efficacy, goal orientation, training content and training design, and how these factors impact the application and utilization of the acquired skills, knowledge and competency from training to the workplace. Analyzing and reviewing these impacts in different and several companies in Saudi Arabia based on employee’s personal experience and response. The research will review and analyze the connection and relations of these impacts in training transfer. Accordingly, identifying the obstacles and challenges in applying all acquired skills and competency in the workplace particularly in Saudi Arabia. The research will check and analyze these major and minor factors based on the demographical background of the individual such as gender, the number of dependents, marital status, age and educational attainment. This is important for the complete understanding of how these factors could hinder or help employee or individual to apply such to meet target or deadline. Additionally, this plays an important role in helping the employees know how they can utilize these skills to improve their performance and achieve success in their respective position or job within their organization. There are several problems which will be addressed throughout and after the research has been conducted. Checking the challenges and difficulties in applying for all training benefits in the workplace. Analyzing each factor and closely study the underlying sub or minor factors for each major factors is the purpose of the research as well. These factors will be calculated and measured based on several parameters which will be interpreted accordingly. The result could be beneficial in conducting in-depth studies that will cover different companies worldwide. Another purpose of the research is to know the actual situation of training transfer in Saudi Arabia. Since the study will focus on different and several companies in Saudi Arabia which have a diverse workforce, it could determine the appropriate and correct solutions for any challenges, issues, and difficulties for employee or individual to apply it in their respective workplace, specifically in Saudi Arabia landscape. How work environment impact training transfer? Do supervisors in Saudi Arabia supports their employee in their training transfer? Can peer support impact the effectiveness of training transfer of the employee? How individual characteristic effect the application of training benefits in the workplace? 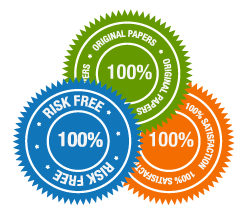 Why self-efficacy affects the employee or individual in applying all learned and acquired competency in the workplace? 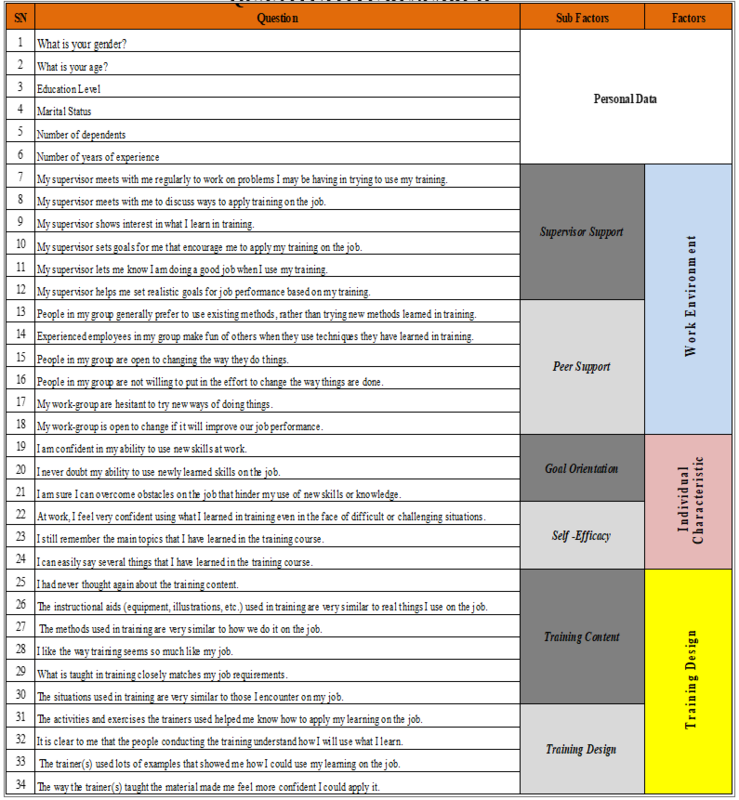 How does goal orientation impact the training transfer or an individual? What is the importance of training design in training transfer? Does training content equally important like training design? These are some general questions that the research should answer during and after conducting the study. With the research methodology and analysis, each question will be elaborately explained in order to acquire the necessary conclusion for the research which can help companies and employees in Saudi Arabia. Additionally, the objective of the study or research is to provide recommendations, suggestion, and conclusion that will be beneficial in defying odds and obstacles to the effectiveness of training transfer in Saudi Arabia companies. At the same time, develop and identify ways, method, process or system that will help employees and organization to apply for all training benefits in the workplace. Whereas, these suggested ways and recommendation can be applied not only in Saudi Arabia but for other organizations/companies worldwide if further studies/research will be undertaken. Sizeable and valuable information and data can be used as a reference (derived from this research) for further studies and in-depth research to structure and formulate training transfer in Saudi Arabia and companies worldwide. This research can be a good source of related information (particularly, the research analysis and recommendation) to standardized training transfer. The Title of the Literature review: The transfer of training; what really matters. A research study conducted by Grossman and Salas (2011) to Identify and summarize the most critical findings relating to the transfer of training. Researchers pointed out that organization report failure to effectively develop skills and anticipate future needs and learning alone is not sufficient for training to be considered effective. The researchers conceptualized the study by identifying the training inputs, Training characteristics, training design and work environment) that have proven to highly crucial for the learning, retention, generalization, and maintenance of targeted skills. This study is used Baldwin and Fords model of transfer to identify factors relating to trainee characteristics, training design, and work environment. By describing each factor in light of previous reviews and more recent empirical findings, results found a strong relationship between trainee cognitive ability and the transfer of training. Self-efficacy has also continually been linked to transfer outcomes. Moreover, transfer climate is a significant predictor of transfer outcomes and the workplace should contain cues that prompt the use of the new skill. The research shows that organization shouldn’t consider the completion of formal training the end of the learning process. Finding suggests that Instead of investigating whether or not these factors that included in review influence transfer, attention should now be shifted to examining the conditions under which the factors are most important. Researcher encourages future researchers to take a closer look at the variables that are extracted in the paper. A research study conducted by Saks and Burke-Smalley (2014) to bridge the micro –macro training gap by investing the relationship between training transfer and firm performance in a sample of the organization. Researchers pointed out the problem is that a very small percentage of what is learned in training is ultimately applied to the work environment by the trainee. The researchers conceptualized the study by transfer of training will mediate the relationship between training methods and firm performance. This study is conducted in Canada. In this study, quantitative data were collected through a survey sent to all training and development professional who were members of training and development association.150 completed the survey out of 300. By applying statistical Techniques data analysis techniques, results showed on the job training methods were used to the greatest extent by organization followed by classroom training and computer based training. Finding suggests that training was positively related to firm performance, and the strongest predictor of training transfer was on the job training. The Title of the Literature review: Supervisory practices and training transfer; lessons from Malaysia. This study is conducted in a large Malaysian government. In this study, quantitative data were collected through self-report questionnaires sent to administrative and technical employees. Of 400 questionnaires were distributed, 306 usable questionnaires were returned. By applying close ended questions and 7 point Likert scales data analysis techniques, results showed that motivation to learn significantly mediated the relationship between supervisory support and training transfer. Supervisory practices positively elevated motivation to learn. In the light of communication practice, the supervisory roles of discussing training objectives, providing training transfer feedback and revealed the benefits of attending training might motivate the employee to learn. Moreover, assignment decisions of supervisors were important predictor of motivation to learn and training transfer. Finding suggests that training and development, particularly the issue of training transfer, is not solely the responsibility of top management, training managers, or trainers. The learning gained during training can be incorporated in work assignments to improve employee and organizational performance. A research study conducted by Brinkerhoff and Montesino (1995) to explores the relationship between management support for training and it’s transferred to the workplace with the longer -range purpose of helping managers understand what they could do to increase the extent to which the trainees they sent to training programs might actually use their training. Researchers pointed out that the amount of expenditure on training investments has a low positive impact in the transfer of training for the workplace. The researchers conceptualized the study on the Relationship between management support for training and the transfer of training to the workplace. This study is conducted in the US, where a sample of employees enrolled in training courses offered by the central corporate learning center was randomly selected and their supervisors were contacted to participate in questionnaires survey. Participants were middle managers and supervisors, team leaders. 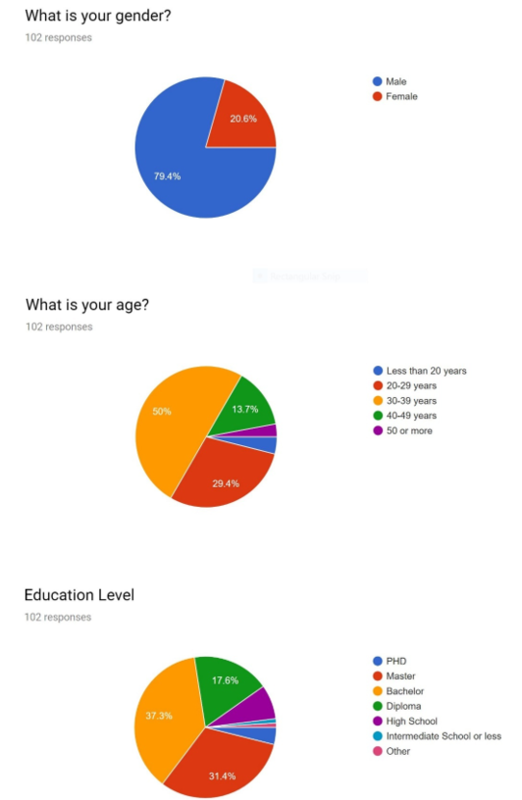 Seventy of ninety-one participants returned the questionnaire. By applying statistical procedures data analysis techniques, results highlights in the study the training in the experimental group reported higher usage of the skills gained than those in the comparison group. And trainees in both groups who reported high-impact transfer perceived more encouragement and reinforcement from their immediate supervisors than did participants who reported low-impact transfer in both groups. Findings suggest that effect of motivation to transfer on transfer outcomes is dependent on the standing of the person in the distribution. Finally, researchers recommend a stronger and more carefully administered intervention, which would probably lead to greater results. Some supervisors are disposed to training and others not. The attitudes that underlie these dispositions are probably quite strong and those whose attitude discount or are negative toward training will take more education, persuasion, and control to change than we were able to apply. The research study conducted by Bossche, Segers, and Jansen (2010) to explores and explain the crucial role of social support in the transfer of training and show that feedback within the social network can add to our understanding of training transfer and the mediating role of motivation to transfer. Researchers pointed out that there is a gap between current performance and the desired goal of full application of what is learned during the training. The researchers conceptualized the studied relationship between the role of feedback in social network and motivation in the transfer of training. In this study, the participants were academic staff members working in a faculty in the Netherlands in which the learning environment was designed following the principles of problem-based learning. Out of 42, 35 completed the questionnaire successfully, resulting in a response rate of 83 percent. Out of the 35 participants, 19 were male and 16 were female. The degree of transfer of training was measured following the Lim and Morris (2006) approach. Participants were presented with a 5-point Likert scale, ranging from ‘nothing at all’ to ‘a lot’. Training motivation to transfer was measured using the 4-item scale of Nijman (2004). Participants were asked to rate four statements regarding their motivation to transfer on a 5-point Likert scale, ranging from ‘totally disagree’ to ‘totally agree’. Social network analysis was used (Wasserman & Faust, 1994). This technique determines the personal network of the participants and enabled to identify the supportive ties to colleagues in the direct work environment. Additionally, the participants were asked to indicate for each tie (1) how frequent the feedback was provided, and (2) the perceived helpfulness of the feedback. Participants were asked to indicate the contact frequency with each tie. On a 5-point Likert scale, ranging from ‘once’ to ‘more than 10 times’, contact frequency could be rated. Finding suggests that the effect of feedback related to a social network is particularly mediated by an increased motivation, showing that supportive network provides not only the right information but also the drive to implement the behavioral changes that are needed. Finally, researchers recommend that interventions aimed at the development of an appropriate network structure of trainees can impact the transfer of training. A research study conducted by Chiaburu and Lindsay ( 2008) to examine how two cognitive components; training efficacy and training instrumentally are differently to training motivation and transfer for specific types of motivation and their subsequent impact on transfer of training. Researchers pointed out that not many researchers have identified the linkages between the transfer of training and self-efficacy, training instrumentally and how it impacted the trainee ability and motivation to learn. This study is employed a self-administered paper questionnaire, surveyed employees from a large service organization in the United States. Participants were asked to answer questions related to training programs attended in the previous year. Of the 289 surveys distributed to the trainees, 254 contained usable information (87.9% response rate). All the questions were anchored using Likert scales from 1 (strongly disagree) to 5 (strongly agree). By applying a structural equation modeling procedures data analysis techniques results in a highlight that, based on the improvements over the proposed model, the final model contains paths added from training instrumentally to perceive training transfer from motivation to learn to motivation to transfer the result provided support to the final model. Finding researchers suggest that motivation to learn and motivation to transfer were differently related to their training antecedents. As expected training self-efficacy was related primarily to motivation to learn while training instrumentally had the stronger impact of motivation to learn. A research study conducted by Burke and Hutchins (2008) to capture and describe how training professionals support the transfer of learning in their organizations on the basis of their experience. Researchers pointed out that a limited number of researches that identified the impact training professionals’ support on Transfer of training. The researchers conceptualized the study on Relationship between trainer demographics, best practice, and Transfer of Training. This study is conducted in the USA. It purposefully selected training professionals who were members of an ASTD chapter located in a large metropolitan city. The survey was administered in such a way for convenient participant access and data control. Of approximately 413 surveys distributed to valid e-mail addresses, 172 surveys were returned. The study used quantitative content analysis procedures to explore participants’ text-based survey responses. Results highlights in the study are that training professionals most frequently identified strategies used in the work environment and in the training design and delivery phase to support transfer. And the role of trainers and supervisors as most involved in supporting transfer best practices. Also, training professionals identified the time after and during training interventions most affecting the transfer. Finding suggest that effect of motivation to transfer on transfer outcomes is dependent on the standing of the person in the distribution. Finally, researchers recommend interventions for boosting training are best carried out in the work context and design and delivery phase take place after training or during and involve trainers and supervisors. Training transfer suggesting current efforts to support transfer within an organization may be disjointed and focally misplaced. This study focused on identifying and understanding in depth the best practices in training transfer as well as the model of transfer. The data gathered from the research was mainly from a group of training professionals in the American Society of Training and Development, USA (Burke and Hurchins, 2008). The technique employed in the analysis of the data was based on the work proposed by Moore &Murphy (1997). Based on the research findings, it is evident that the interventions and techniques employed in training transfer are effective if applied within the work environment context, design as well as delivery phase. It also has to be with the participation of both trainers and supervisors. Some of the activities that garner the attention of trainers include such factors as coaching, supervisory support, transfer measurement, opportunities for one to perform, job-relevant training as well as interactive training among others (Burke and Hurchins, 2008). Given the great desire to ensure that supervisors, trainees and trainers are held accountable for the training transfer (Kopp, 2006; Longnecker, 2004), it is these factors that play an important role in coordinating other training professionals. For instance, Bersin (2006) reported similar factors as playing a role in garnering top attention from their trainers. It is these factors that in turn, are used in informing prioritized implementation of certain transfer interventions created, used and evaluated by the trainers. The Title of the Literature review: Training Transfer and Training Motivation: The Influence of Individual, Environment, Situational, Training Design, and Affective Reaction Factors. This study helps build on the existing training literature by explaining the role and purpose of different factors that affect the training transfer process. Training Transfer and Training Motivation is to examine the effects of individual, environment, training design, and effective reaction factors on training transfer and training motivation. Mediates the relationship between transfer design and transfer motivation and mediates the relationship between perceived content validity and transfer motivation. Transfer motivation mediates the relationship between performance and training transfer. The findings explain the roles of each stakeholder (trainers, trainees, supervisors, peers, and top management), which will lead to maximizing training transfer at the workplace. The Title of the Literature review: The Impact of Perception of Organization Transfer Climate Factors and Trainees Characteristics on Training Transfer: The Context of Mergers and acquisitions. The Title of the Literature review: Effects of Work Environment on transfer of training: Empirical evidence from Master of Business Administration Programs in Vietnam. The research study conducted by NGA T.P. Pham, Mien S. R. Segers and Wim H. Gijselaers . This study to explore the relationship between work environment factors and the participants transfer strategies with transfer process, the findings support that work environment factors affected transfer in different ways .the significant findings of this study confirm the importance of what happens at the workplace after the training. The impact of the trainees job autonomy on transfer implies that the more the trainees degree of freedom in carrying out their job, the greater their ability to organize and execute their work .Supervisor support influences job autonomy this can be explained by the possibility that when an employee is allowed autonomy .Transfer strategy plays a significant role , it direct effect in the relationships between supervisor support after training and transfer .This study makes several future contributions . A research study conducted by M. Ubeda-Garcia, E. Claver Cortes, B. Marco-Lajara, P. Zaragoza-Saez (2014) explains that for one to know the extent to which strategic orientation influences the investment firms in training, the preparation of formal plans and the type of training developed. Study focused on training policy in hotels and how the strategic orientation influences by the investment that firms make is training, how to prepare a formal plans, and what the type of training developed is. It is intention to check whether this strategy. Training link has an impact on hotel performance. A comprehensive analysis of the literature was conducted to identify the main research and establishing the hypotheses to be tested. The development of a training policy oriented to human capital development in hotels following a differentiation strategy leads to improved business results both directly and indirectly. The human resource is important factor in customer satisfaction, service quality and organizational performance. The study provides evidence of the pre-eminent role that human resources together with their management – play in the profitability of hotel industry firms. The survey was done in a manner for respondents to conveniently answer all items/points in the survey which can be accessed via Google Form. All respondents were advised to take the survey based on their personal views and experiences. Then series of follow-ups were being done to ensure that respondents will complete the survey on a specified deadline. Since it can be accessed online, respondents could freely answer all questions without any external influences that may affect the results of the survey. They can comfortably access it even at their mobile and other electronic devices. Hence, no personal or actual meetings with the respondents were done in conducting the survey. The research commissioned 102 random respondents with different demographic backgrounds such as different age group, gender, educational attainment, marital status and number of dependents group. Each demographical background of the respondent could provide different interpretations and results once closely studied. After we gather all their answers and feedback, we will them calculate their responses based on the set parameters. The first part which includes personal related questions will be evaluated to determine the demographical background of the respondents the second part will be their personal views and ideas on different factors that impact their training transfer experience in their respective companies/organization. Each point or questions were studies and analyzed to quantify their responses then measure it in relations to the corresponding factors affecting the training transfer. Questions are interconnected, comprising an average of 4 questions for each minor factors and 8 questions (average) to represent the major factors. Their responses will be calculated and analyzed for its relations and impact on different minor and major factors. Comparing each other to comprehensively determine the impact of these factors in training transfer based on the respondent’s feedback and responses. The respondent’s feedback will be calculated on how many of them answer strongly agree, agree, neither agree nor disagree, disagree and strongly disagree. Based on our provided questions in the survey, agree and strongly agree can be qualified as a positive response while disagreeing and strongly disagreeing can be viewed as a negative response. Accordingly, if the respondent answered “strongly agree” and “strongly disagree” is a clear indication of the actual situations his/her companies/organization since we firmly believe or not in the provided question. However “neither agree nor disagree” indicate indecisiveness which means that it may or may not happen in the workplace. If several respondents answered “neither agree nor disagree” it could mean that it does not commonly experience or observed in their organization. Respondent’s collective responses will be compared to one another. It will be analyzed per each question to give specific analysis or findings, then will be collectively analyzed to know respondent’s feedback for each sub or minor factors. After that, it will be then calculated and analyzed as well to determine their responses per each major factors. Accordingly, from these findings and analysis of the responses, interpretation will be utilized in formulating recommendation and conclusion. This study focuses on the use of both qualitative and quantitative data. Quantitative data represents information that represents quantities. In this case, quantitative data represents data that can be measured and written down numerically. As a result, ratios, percentages, numerals, fractions, graphs, histograms, charts, and other diagrams represent quantitative data. The use of the mixed approach provides a two-faceted method that allows us to evaluate the targeted subject matter through different angles or perspectives. This broadens the view and allows the study to evaluate an expanded spectrum of aspects regarding organizational culture and the performance of employees. Additionally, this approach allows the study to broaden its view to include both descriptive data as well as the numerical figures to represent and evaluate the targeted concepts for the study. The data was collected in this study was done using qualitative methods. The shortcoming, in this case, is that there were no experiments (field research) used and, hence, there is reduced reliability and validity of the results. However, the findings in this study were compared with literature, as well as the qualitative and quantitative data approaches from previous experiments thus, providing an effective internal checks and balances. This ensures that the data employed is within the context, non-biased, and representative of the observed phenomena on the samples. We used quite a number of variables to measure the impact of Work Environment, Individual Characteristics and Training Design toward Training Transfer in KSA Companies. The data collected were analyzed through MS Excel. The data was then compiled and presented in form of tables, charts, and graphs. This was very critical in creating a visual picture of how the work environment, individual characteristics and training design impact transfer of skills and hence, playing a role in informing the further analysis. Comparative analysis was employed in analyzing the collected data. This analytic approach mainly focused on evaluating the data collected from the interview as well as those from literature. The evaluation of the quantitative data ensures the study comes up with a data set that is expansive and informative regarding the subject matter. Additionally, the comparative analysis of the primary data (From our study) with the secondary data (literature) was done through a systematic literature review. From this study, there are several factors that play an important role within the work environment. These factors have a direct impact on the transfer of skills during training and hence, influencing development, sustenance, and impact of the organizational culture. The core aspects include supervisory support, peer support, and the relationship between the two. The interaction between the managers and the employee forms the basic dynamic important in enhancing communication of policy, strategic approaches, and the direction of training. From the study, we analyzed the various roles of the supervisors such as meeting with trainees regularly to work on problems they may be having. 39.6 % of the participants agree that they meet with their supervisors to go over the problems they might be facing. 39.2 % of the participants agree that their supervisors meet to help them on ways in which they can apply their training on the job. 38% agree that their supervisors demonstrate an interest in the things they learn during training. Additionally, 32.4 % get the motivation to apply for training on their jobs while 33.3% are aware that their trainees are doing a great job whenever they use training. In turn, 30.4% agree that their supervisors set realistic goals when it comes to job performances based on their training. However, there is a significant percentage of >20 % who feel that they do not get sufficient or no supervisory services at all. Therefore, it is the role of both the trainee and the supervisor to show interest and commitment that will ensure training skills are effectively transferred and impact their job development and career growth. It is not only the role of the supervisor to offer support and motivation, but the trainee has to also be willing and self-driven to receive the support at their disposal. Findings and Analysis: Majority (41 respondents out of 102) receives support from his/her supervisor. However, the number of “neither agree nor disagree” and disagree should not be ignored because it means that they are not experiencing any support from their respective supervisors. Findings and Analysis: 40 respondents experience meeting with their supervisor to discuss ways in their training transfer. However, just like question number 7, the “neither agree nor disagree” and “disagree” indicate that these meeting may seem not occurring. 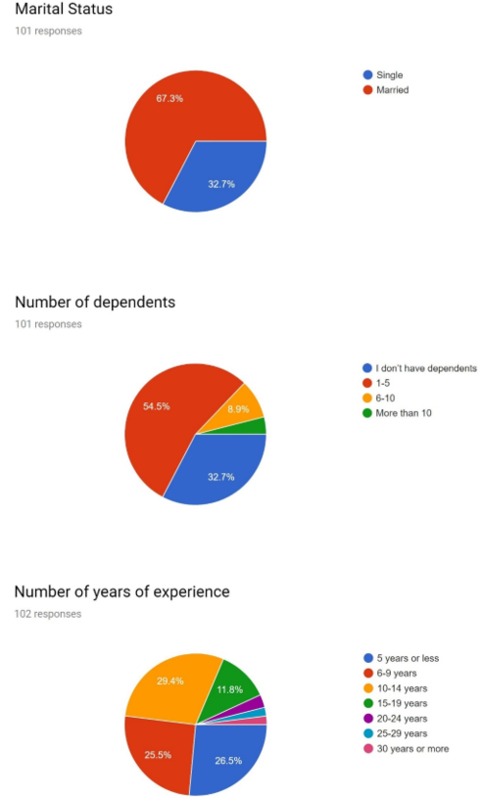 Findings and Analysis: Many respondents (37 respondents) agree that their respective supervisor show interest with their new skills and knowledge. However 20 respondents have doubts (neither agree nor disagree) and 25 respondent disagree that their supervisor shows interest, which is a negative indication. Findings and Analysis: 33 Respondents agree and 15 respondents strongly agree, that their supervisors are setting goals for them which somehow a good indication that their supervisors are involved in motivating them to improve and develop. Findings and Analysis: There are 24 neither, 29 Disagree and 6 strongly disagree on this matter which is not a good indication that employees are receiving recognition or acknowledgment from their supervisor. Although majority or 34 respondents experienced positive confirmation. Findings and Analysis: Unfortunately, majority or 33 respondents with 22 neither and 7 strongly disagree that their supervisors are helping them to set realistic goals for job performance. It’s a negative indication that after the employee receives training realistic goals are not set. Findings and Analysis: Almost half of the respondents with 9 strongly agree may seems not experimental in applying new learnings in the workplace. They seem hesitant and prefer to use the existing method rather than making initiatives in applying new techniques and method. Findings and Analysis: Although majority or 38 respondents are making fun of others for using new techniques there are 34 Disagree and 11 Strongly Disagree that they don’t poke fun of others by using new techniques they acquire from training. It a good indication that employees welcome new development and techniques in the workplace, encouraging initiatives and take risks. 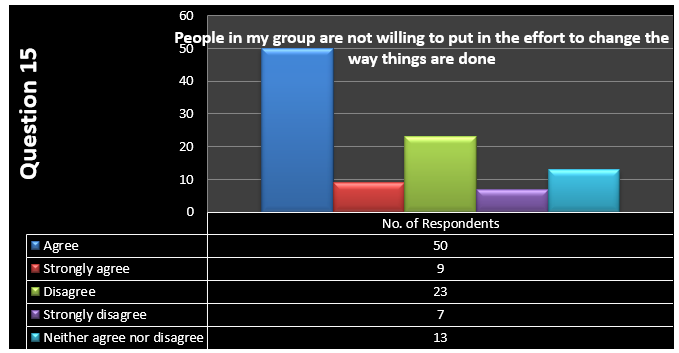 Findings and Analysis: Although majority or 50 respondents in the group are not willing to put in the effort to change the way things are done, there are 23 Disagree and 7 Strongly Disagree that they are not willing to put in the effort to change the way things are done. This indicates that most employees are able to apply what they have learned in training and hence boosting work performances and efficiency. 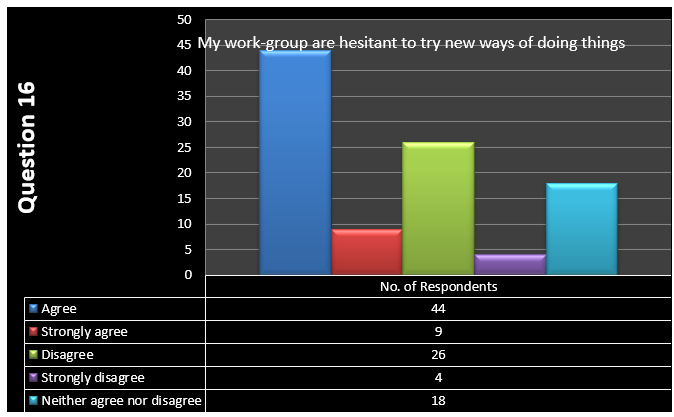 Findings and Analysis: Unfortunately, majority or 44 respondents in the group are hesitant of trying new ways to do things. However, 26 Disagree and 4 strongly Disagree that they are hesitant of trying new ways to do things. This indicates that if properly motivated, employees will be able to try new ways of doing things, hence, ensuring that there is a better chance of substantiating the significance of training and training transfers in boosting work performances and efficiency. Findings and Analysis: It is quite encouraging to notice that 56 and 11 respondents are open to change if it will improve their job performance. This means that training content and design has to be aligned to meet the job needs of the trainees so that it is applicable and impactful. 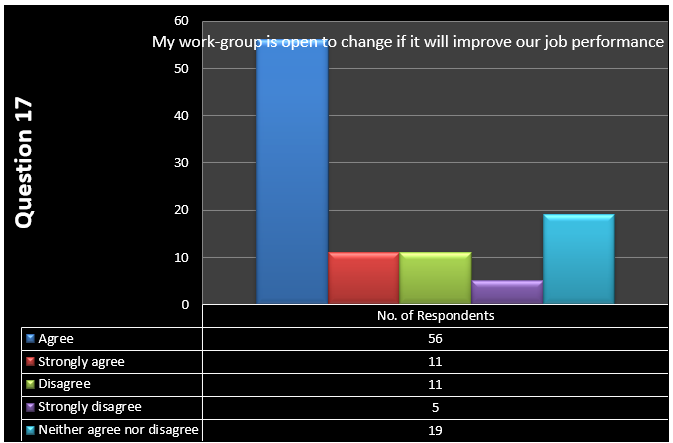 However, 11 Disagree and 5 strongly Disagree that they are open to change if it will improve our job performance. Findings and Analysis: It is exciting to discover that 50 and 35 respondents agree and strongly agree that they are confident in their abilities to use new skills at work. This means that trainings are very important and should be used to enhance the confidence of the trainees in their area of specialty and hence boosting performances. However, 5 Disagree and 3 strongly Disagree with this. This could be attributed to a number of factors such as poor understanding, negative attitudes towards training, and poor delivery of training content to meet their nature of understanding among other factors. Findings and Analysis: It is exciting to discover that 56 and 24 respondents agree and strongly agree that they never doubt their ability to use newly learned skills on the job. This means that trainings are very important and should be used significantly in enhancing the confidence of the trainees in their area of specialty and hence boosting performances. However, 6 Disagree and 5 strongly Disagree with this. Findings and Analysis: Fortunately, 53 and 19 respondents agree and strongly agree that at work, they feel very confident using what they learned in training even in the face of difficult or challenging situations. This means that the training did not just deliver the intended message, but also gave the trainees the confidence that despite the challenges, they trust the skills and knowledge they have to solve their problems. However, 9 and 5 respondents Disagree and strongly disagree with this respectively. 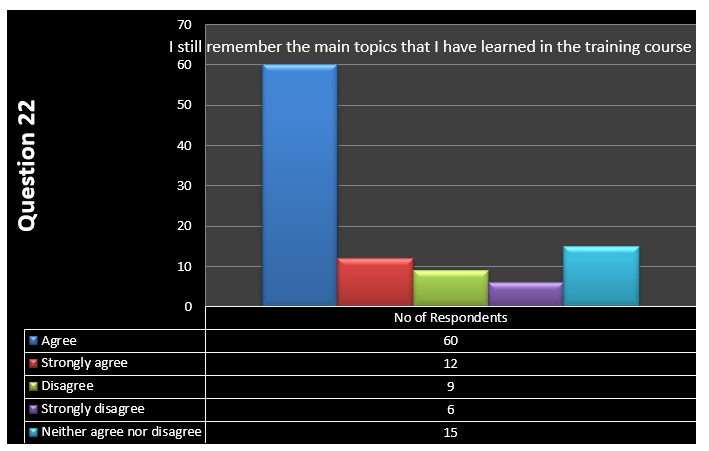 Findings and Analysis: Fortunately, 60 and 12 respondents agree and strongly agree that they still remember the main topics they learned in the training course. This means that they understood what was being taught during training and hence, confident to apply this into their jobs. However, 9 and 6 respondents Disagree and strongly disagree with this respectively. Findings and Analysis: Fortunately, 64 and 8 respondents agree and strongly agree that they can easily say several things that I have learned in the training course. This could explain the reason a good number of respondents feel confident to apply this into their jobs. However, 12 and 3 respondents Disagree and strongly disagree with this respectively. Findings and Analysis: Unfortunately, 33 and 6 respondents agree and strongly agree that they had never thought of the training content. This could explain the reason some of the respondents feel that they do not have the confidence to apply this into their jobs. However, the good thing is that there is a significant number of about 33 and 7 respondents who Disagree and strongly disagree with this respectively. This means that there is a good number that is ready to address the issues they have in their work environment and hence, are eager to know whether the content of the training is tailored to address their needs. 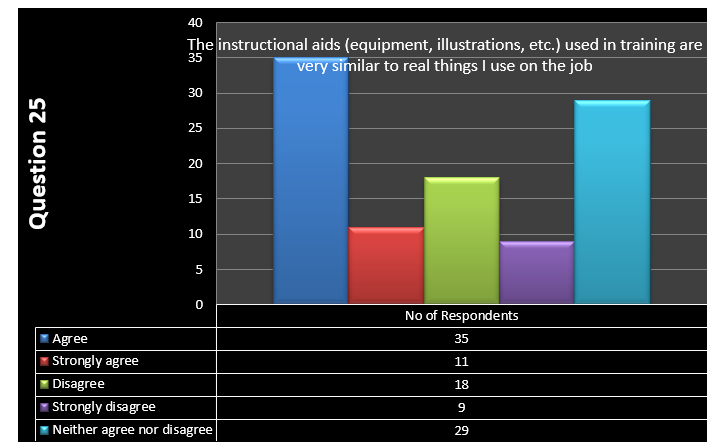 Findings and Analysis: 35 and 11 respondents agree and strongly agree that the instructional aids (equipment, illustrations, etc.) used in training are very similar to real things I use on the job. This means that the techniques employed are suitable for transfer of knowledge and skills to the trainees with a high level of efficiency that boost their understanding. However, 18 Disagree and 9 strongly Disagree with this. 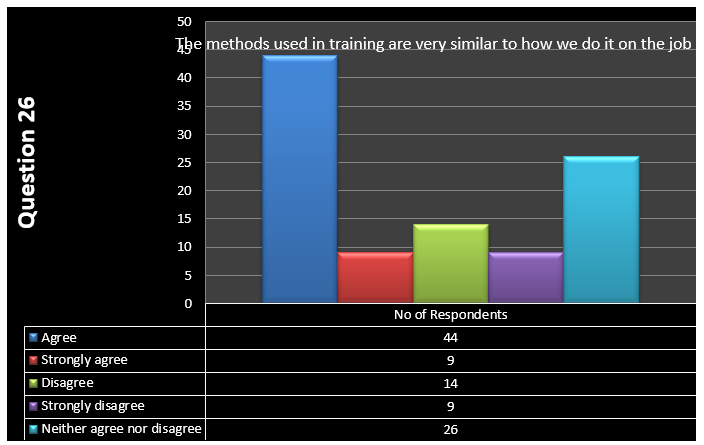 Findings and Analysis: 44 and 9 respondents agree and strongly agree that the methods used in training are very similar to how we do it on the job. This means that the techniques employed are suitable for transfer of knowledge and skills to the trainees with a high level of efficiency that boost their understanding. However, 14 Disagree and 9 strongly Disagree with this. Findings and Analysis: 47 and 16 respondents agree and strongly agree that they like the way training seems so much like my job. This justifies the need to continue training as they mimic the same conditions as those in the work environment making it very easy for the trainees to identify with and understand how they will apply the knowledge and skills acquired into their jobs. However, 11 Disagree and 5 strongly Disagree with this. Findings and Analysis: 55 and 8 respondents agree and strongly agree that what is taught in training closely matches their job requirements. This justifies the need to continue training in order to help trainees apply what they have learned and hence boosting their knowledge and skills in their areas of specialty. However, 13 Disagree and 2 strongly Disagree with this. Findings and Analysis: 52 and 10 respondents agree and strongly agree that the situations used in training are very similar to those I encounter on my job. This justifies the need to continue training in order to help trainees apply what they have learned and hence giving meaning to the resources channeled into training transfers. However, 14 Disagree and 6 strongly Disagree with this. Findings and Analysis: It is exciting to discover that 52 and 10 respondents agree and strongly agree that the activities and exercises the trainers used helped them know how to apply their learning on the job. This justifies the need to continue training in order to help trainees apply what they have learned and hence giving meaning to the resources channeled into training transfers. However, 14 Disagree and 6 strongly Disagree with this. Findings and Analysis: It is exciting to discover that 53 and 7 respondents agree and strongly agree that it clear to them that the people conducting the training understand how the trainee will use what they have learned. This means that the training content and delivery of training materials are created in such a manner that the needs of the trainees are well taken care of and hence, effective and contributes towards the understanding and confidence of trainees. However, 13 Disagree and 5 strongly Disagree with this. 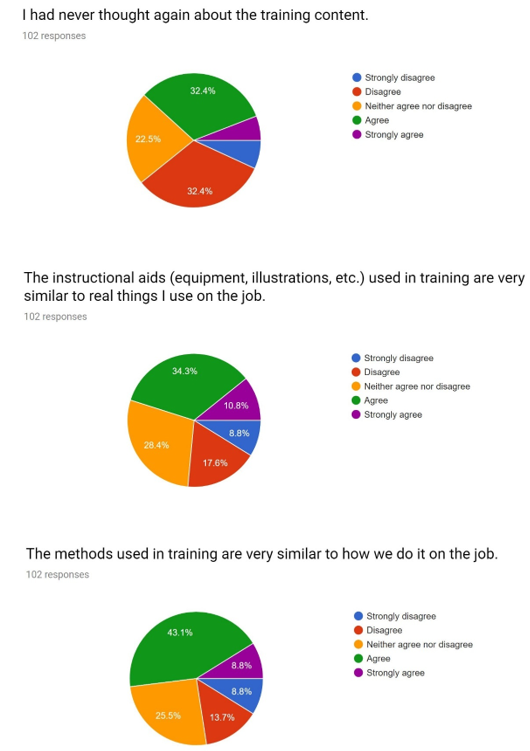 Findings and Analysis: One amazing thing is that 49 and 12 respondents agree and strongly agree that the trainer(s) used lots of examples that showed me how I could use my learning on the job. This means that the trainees were able to identify with the examples given and hence boosting their understanding and confidence to apply the material they have learned through training into their jobs. 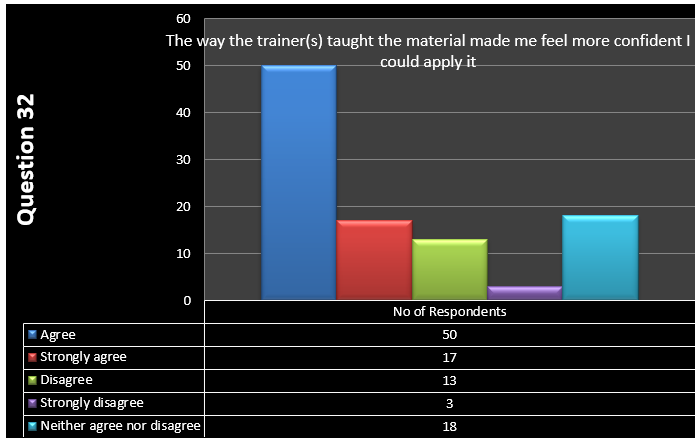 Findings and Analysis: It is exciting to discover that 50 and 17 respondents agree and strongly agree that the way the trainer(s) taught the material made me feel more confident I could apply it. This means that trainings content and delivery of training materials is effective and contributes towards the understanding and confidence of trainees. However, 13 Disagree and 3 strongly Disagree with this. For an individual to efficiently and successful gain skills, they have to have the right attitude. This is a reflection of what goals they aim to achieve as well as how efficient they are in terms of knowledge acquired during training. In this study, we analyzed individual characteristics as a factor of goal orientation and self-efficacy. From the study, 49.5 % of the research participants agree while 34.7 % strongly agree that they are very confident of their abilities to make use of the skills they acquire at their places of work. In combination, this is about 85 % of total participants. As a result, we can say that self-confidence plays an important role in the transfer of skills. The other remainder 15 % of participants that disagree and strongly disagree with this may be having other underlying factors that could be ripping them of their self-confidence. This could be past experiences, lack of self-esteem, past failures among others. These results can be used in further studies to determine the factors that affect one’s confidence in using new skills at work. This is because the study further reveals about 71% of research participants that are in agreement that they can actually overcome the obstacles that hinder them from making use of their newly acquired skills at their places of work. When it comes to self-efficacy as a measure of transfer of skills at the workplace, 52% and 18.6% of the research participants agree and strongly agree respectively that they feel very confident using what they have learned despite challenging situations. Additionally, 58.8% and 11.8 % agree and strongly agree that they can recall what they learned during their training course. Judging from these results, some of the research participants might have forgotten what they learned explaining the slight decline in percentage from being confident to recalling the main topic learned. The most important factors when it comes to training is the content and the design of the training. In other words, the information that is being shared during training and the methods employed in sharing the information determines whether or not the trainees understand and acquire the skills being taught. Their understanding thus trickles down to whether they are confident enough to apply the learned skills at their workplaces. From this study, the ratio of participants that who have thought about the training content after training is almost equal to those that have not thought about. There is also a significant 22.5 % of those that do not know whether or not they have thought about the training content. Additionally, the instructional aids used during training are similar to those used in jobs for about 44% of the participants and for about 18% of the participants, they had not thought about the training content after training. There is also a 28.4% who are not sure whether this is the case for them. This explains the reason why almost a similar ratio like the manner in which training seem like their jobs and their job requirements and situations at work closely match the training content. From this study, the methods employed by the trainers in training played an important role in helping trainees know how to apply the skills learned on their job. However, about 20 % of the trainees feel that the methods employed by the trainers in training did not play an important role in helping them know how to apply the skills learned on their job. 52.5% agree that their trainers are well aware of the significance of what they are training has on how the trainees will use it. In that case, over 50% agree that the trainers use relevant examples of how they can use the knowledge acquired in their workplaces and hence imparting in them the confidence that they can indeed apply it. The main purpose of this present study is to examine the impact of the work environment, individual characteristics and training design on the transfer of skills. From the results, there is a clear indication that environment and individual characteristics should inform the methods that are used by trainers to transfer skills. From this study, it is evident that there is an indirect effect between transfer design & validity of the training content to the outcomes of the training. These results are in agreement with Gegenfurtner et al., 2009, in highlight the importance of supervisory support to training transfer. This is because it serves as an intermediary between training design & content and training transfer. In spite the fact that our findings support the link between supervisory and peer motivation to transfer training, there is an indication of the significant direct impact on training transfer design and validity of the training content on transfer. This finding is in agreement with previous theories by Holton (2005) that assumes a direct link between individual characteristics and training transfer. Additionally, to such factors, as self-efficacy and goal orientation of the trainees play an important role in ensuring that there is successful training transfer. Some of the factors that could be used to explain self-efficacy difficulties for some research participants could be that they are slow learners and during training, they miss out on important aspects of the course that makes them have no confidence in applying the skills learned. Additionally, they might not be attentive for many reasons such as destructions from within and without hindering their conception and understanding of what is being taught. Therefore, for one to be efficient, the surrounding, as well as personal features, have to work hand in hand to make the transfer of skills a success. Previous empirical studies demonstrate that there is a wide range of interrelationship between motivation to transfer and training transfer from a value close to zero to higher values (Gegenfurtner et al., 2009). Despite the fact that our research findings require further substantiation in future research, the truth is that they do suggest an impact on training transfer by such factors as the work environment, individual characteristics as well as training design, and, hence, serving as an important extension to previous theories: The effect of motivation to transfer depends not only on the operationalization of the dependent variable (Gegenfurtner et al., 2009). Finally, this study gives an expansion into the training transfer topic as it relates to the performance of the companies in a wide range of aspects. Previous studies often use the number of employees getting training as a measure of company performances. Because of this, there is always very limited knowledge of what type of training is important for the optimal outcome. The results derived from this study indicate that while employees are getting trained, not all of them apply the knowledge they get into their jobs. This means that by just training employees, it is not a guarantee that the companies’ performances will improve. Other factors such as employee efficacy, supervisor & peer support as well as the training design all play a role. From this study, it is evident that the work environment, individual characteristics, and training design however good they are, does not guarantee top-notch performances. This is in line with such studies as Thorndike & Woodworth (1901) and DeRouin et al., (2005) who report that most companies fail because they rely so much on on-the-job training only without focusing on other important factors that could hinder that very training from being impactful. The use of interviews this study was time-consuming and their reliability and validity is low. The approach used means that the researcher will not have the chance to clarify the questions and prompt the respondents. This gives rise to so many faulty answers and responses provided out of context. The fidelity to the questionnaire results is dependent on the ability of the respondents to understand the questions and prompts prior to giving accurate responses. Additionally, the cost of conducting interviews is too high. This means that the study has to use a small number of study participants in order to minimize cost significantly. Therefore, with a reduced data set, the inferences drawn from the study may not be representative of the entire population and, hence, this reduced the validity and reliability of the collected data. The impact of individual characteristics, work environment as well as training design on the transfer of skills is one of the major areas most companies fail to achieve their potential and employee success. Because of this, these factors present a major challenge in studying this market. There are several factors and issues that influence the transfer of skills in a wide range of companies across the globe. These factors are not uniform as a result, there is presentation of a big challenge in consolidating a study that can present a picture of the KSA companies training sector. Finally, the measurement of transfer training was solely based on the estimates drawn from participant responses. This often suffers from perceptual bias which translates into an overestimation or underestimation of the actual transfer programs of particular training. In spite the fact that the study took a specific focus on acquisition and utilization of the new skills in the workplace, it did not go further to determine what factors could be hindering the employees from actually applying the knowledge they get from training. It also does not supply data on whether these skills have a direct impact on the performance of the organization. This study has taken the very initial step in bridging the gap in training transfer for many small and large companies alike. The study has tested the relationship between work environment, individual characteristics & training design with transfer training. As anticipated, work environment, individual characteristic, and training design have a positive impact on training transfer. However, there is a significant percentage that still does not know what to make of these factors when it comes to training transfer. This means that it is the role of companies to take up the responsibility to implement strategies and interventions that will not only motivate their employees to apply the skills they learn in their jobs; but also actively get involved in preparing training content based on the gaps that exist at the workplaces. Companies have to also understand the nature of employees they have by encouraging close supervisor-employee work relationships in order to inform the techniques and methods to be employed in training. In so doing, the training transfer will not only be successful but will also boost the performance of the companies. With regard to implications of this study, the results that we have obtained provide support for the importance of transfer training. The truth is that transfer training has great implication beyond an individual trainee characteristics, work environment, and training design. The first thing is that companies have to take the time to assess the training needs of their employees and come up with viable and practical techniques through which they can transfer the skills to them. Just as DeRouin et al., (2005) states, it is important that companies take the aspect of training transfer seriously and develop a well-designed training program based on the job of trainees with a mixture of approaches that suit the trainees’ job description (Bersin, 2004; Hovis, 2012). There is a need for companies to cultivate a strong coworker and supervisory relations within the company. These interrelationships should be fostered through open communication channels and mutual respect. This will enhance good relations, which in turn, will enhance the synergy among the employees and thus, enhancing the productivity and performance of the firm as a result of proper training needs. Companies need to embrace adhocracy which simply offers a distinct work environment for innovation and creativity among the employees and hence successful training transfer. This will in turn permit workers to exercise freedom of thought and create solutions that are proven to be crucial for the most successful companies in the global market through training. The internal environment of a company should be flexible and perceptive to the changes in the external environment. In many cases, the success of a company is dependent on its ability to adapt to the transforming markets and consumer behavior. Therefore, flexibility will allow the firm to equip its workforce efficiently and establish the right culture to ensure success through proper training programs, content, and techniques for transfer of skills and knowledge. Additionally, there is a need to recognize and reward excellent service delivery or performances by workers after training. This will motivate the workers to not only sign up for training but also ensure that the things they learn during training are applied in their jobs. Bersin, J. (2004), The Blended Learning Book (San Francisco, CA: John Wiley & Sons). Bersin, J. (2006). Companies still struggle to tie training to business goals. Training, 43(10), 22-23. Brinkerhoff, R. O., & Montesino, M. U. (1995). Partnerships for training transfer: Lessons from a corporate study. Human Resource Development Quarterly, 6(3), 263-274. Burke, L. A., & Hutchins, H. M. (2008). A study of best practices in training transfer and proposed model of transfer. Human resource development quarterly, 19(2), 107-128. Chiaburu, D. S., & Lindsay, D. R. (2008). Can do or will do? The importance of self-efficacy and instrumentality for training transfer. Human Resource Development International, 11(2), 199-206. Chiaburu, D. S., & Tekleab, A. G. (2005). Individual and contextual influences on multiple dimensions of training effectiveness. Journal of European Industrial Training, 29(8), 604-626. Colquitt, J. A., LePine, J. A. and Noe, R. A. 2000. Toward an integrative theory of training motivation: A meta-analytic path analysis of 20 years of research. Journal of Applied Psychology, 85: 679–707. Ergonomics in Design, 13, 23–6. Gegenfurtner, A., Veermans, K., Festner, D. and Gruber, H. (2009), ‘Motivation to transfer training: An integrative literature review’, Human Resource Development Review, 8, 403–23. Grohmann, A., Beller, J., & Kauffeld, S. (2014). Exploring the critical role of motivation to transfer in the training transfer process. International Journal of Training and Development, 18(2), 84-103. Holton, E. F. III (2005), ‘Holton’s evaluation model: new evidence and construct elaborations’, Advances in Developing Human Resources, 7, 37–54. Hovis, S. (2012), ‘Developing capable leaders through blended learning’, T + D, 66, 5, 76–7. Kopp, D.M. ( 2006). Trainer self-loathing. Human Resource Development Quarterly, 17(3), 351-357. Lim, D. H., & Morris, M. L. (2006). Influence of trainee characteristics, instructional satisfaction, and organizational climate on perceived learning and training transfer. Human Resource Development Quarterly, 17(1), 85-115. Lim, D. H., Morris, M. L., & Yoon, S. W. (2006). Combined effect of instructional and learner variables on course outcomes within an online learning environment. Journal of Interactive Online Learning, 5(3), 255-269. Mathieu, J. E., & Martineau, J. W. (1997). Individual and situational influences on training motivation. Improving training effectiveness in work organizations, 193, 221. Ng, K. H. (2015). Supervisory practices and training transfer: lessons from Malaysia. Asia Pacific Journal of Human Resources, 53(2), 221-240. Nijman, D. J. J. M. (2004). Supporting transfer of training: Effects of the supervisor. University of Twente. Pham, N. T., Segers, M. S., & Gijselaers, W. H. (2010). Understanding training transfer effects from a motivational perspective: A test of MBA programmes. Business Leadership Review, 7(3), 1-25. Quiñones, M. A. 1997. “Contextual influences on training effectiveness”. In Training for a rapidly changing workforce: Application of psychological research, Edited by: Quinones, M. A. and Ehrenstein, A. 177–201. Washington, DC: American Psychological Association. Saks, A. M., & Burke‐Smalley, L. A. (2014). Is transfer of training related to firm performance?. International Journal of Training and Development, 18(2), 104-115. Thorndike, E. and Woodworth, R. (1901), ‘The influence of improvement in one mental function upon the efficiency of other functions’, Psychological Review, 8, 247–61. Tracey, J. B., Hinkin, T. R., Tannenbaum, S. and Mathieu, J. E. 2001. The influence of individual characteristics and the work environment on varying levels of training outcomes. Human Resource Development Quarterly, 12: 5–23. Úbeda-García, M., Cortés, E. C., Marco-Lajara, B., & Zaragoza-Sáez, P. (2014). Strategy, training and performance fit. International Journal of Hospitality Management, 42, 100-116. Van den Bossche, P., Segers, M., & Jansen, N. (2010). Transfer of training: the role of feedback in supportive social networks. International Journal of Training and Development, 14(2), 81-94. Wasserman, S., & Faust, K. (1994). Social network analysis: Methods and applications (Vol. 8). Cambridge university press.